The Gold Standard is here. OCZ's Gold series Triple Channel kits set the standards for enthusiast-oriented memory module kits developed for the upcoming Intel Core i7 processor / Intel X58 Express Chipset. This triple channel 6GB kit is rated to run at 1600MHz and has CL 8-8-8-24 timings for speedy performance. Each kit is 100% hand tested for performance and compatibility. The XTC heat spreaders are designed to take advantage of the micro convection currents that occur in the channels between the individual memory chips. And the gold mirrored honeycomb design facilitates maximum heat distribution. This new 6GB kit ensures optimal performance via an ideal combination of low voltage requirements, speed, and latency, so it's a perfect match for the Nehalem platform to unleash performance you could only dream of before. Designed for Intel Core i7 Platforms The OCZ Gold PC3-12800 DDR3 memory kit comes in a triple-channel configuration designed specifically for Intel’s new Core i7 processor/X58 chipset-based platforms. DDR3 1600 DDR3 1600 delivers amazing performance and platform compatibility with up to 12800MB/s memory bandwidth per channel for the ultimate work and gaming power! 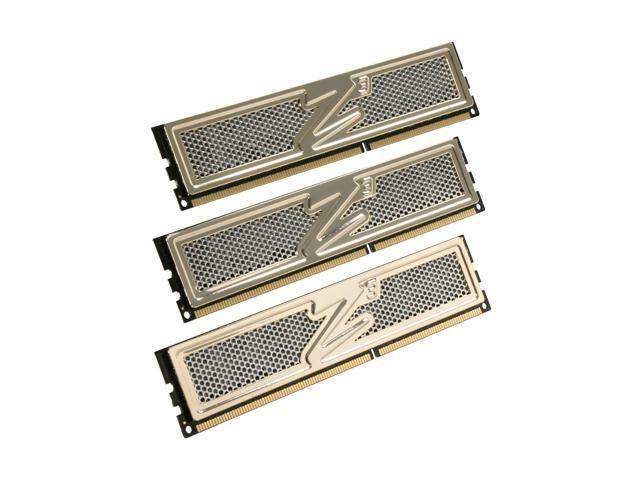 Gold Layered Z3 XTC Heatspreaders Gold layered Z3 XTC (Xtreme Thermal Convection) heat spreaders with an innovative honeycomb design significantly increase ventilation and heat dissipation through more direct contact to memory ICs. 100% Hand Tested Each OCZ Gold PC3-12800 DDR3 memory kit is 100% hand tested to ensure supreme quality and maximum compatibility with the latest X58 motherboards. Pros: Bought this in 2008 to go with my i7-920. NEVER once had an issue with them. Speeds as advertised. Never overclocked. At the time, 2008, these looked GREAT. Cons: - Could get slightly warmer than I am now used too..but never had an issue due to it so no eggs being taken away. Pros: It worked for a few years. They replaced the RAM with only a slight hassle. Cons: Have had 2 sticks go bad on me. Occasionally have had stability problems. Other Thoughts: I've replaced these with 6x4GB G-Skill 1866MHz DIMMs purely because they were a steal at the time; these sticks showed no signs of slowing down by any means. I did, however, notice that the G-Skills actually ran at their advertised speed and timings. I'll echo what another reviewer said: I wouldn't recommend OCZ anymore, but these are by no means poor sticks. Other Thoughts: Triple-channel is unique and I don't think it'll be compatible with most other desktops, but it's worked fine for my compatible motherboard. Pros: Has lasted close to 3 years when underclocked. Cons: I've been running this kit for almost 3 years. Unfortunetly, I didn't realize that I was running them at 1082 instead of the advertised 1600. Simply put, the RAM does not run at 1600. The machine bluescreens. Pros: This memory has treated me well. Purchased on March 2010 and these sticks have endured thousands of hours of system uptime and equally as many hours in gaming. However, I purchased these sticks when OCZ was more respected among system builders. There was a time when I recommended them to everyone. Cons: I can't really dock ANY stars for a product that lasted me almost three years. I just wish that OCZ would have kept up with their quality control and image. Other Thoughts: Interestingly enough, I bought these in 2010 at $170! Amazing what a few years does. Even for the 6gb triple channel kits they are obnoxiously cheap. Overall, would no longer recommend this brand to any system builders. If you're building a system that is using triple channel memory, you're doing it wrong anyway.